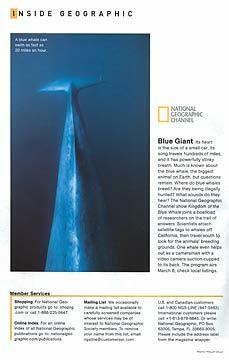 I am very fortunate to have one of my blue whale photos (Balaenoptera musculus) appear in the March 2009 issue of National Geographic Magazine. It is an image of a whale’s dorsal ridge and fluke, taken underwater, in the “Inside Geographic” section near the end of the magazine which describes an upcoming NG television special about blue whales and the researchers who study them. It is related to the excellent article on blue whales appearing earlier in the same issue, written by Kenneth Brower and beautifully photographed by the world’s foremost whale photographer, Flip Nicklin.